There wasn't much David Iwanski didn't know about Arizona water when he joined AMWUA's Board of Directors in 2014. 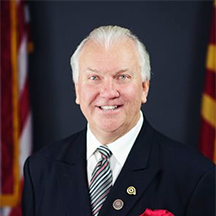 Avondale Councilmember Iwanski trained as an attorney, spent four years in the Army and served as an aide to the late Arizona U.S. Congressman Eldon Rudd. It was Rudd who instructed him to learn everything he could about water and energy in the West. That led to a job with the U.S. Bureau of Reclamation. Since then, Councilmember Iwanski has served as Water Resources Manager for the cities of Glendale and Goodyear. He spent those years as a member of AMWUA’s Water Resources Advisory Group. Mr. Iwanski, 62, was appointed to Avondale’s City Council in 2014 but opted not to run for a seat this year. He preferred his current job as Executive Director of the AZ Water Association, which helps to educate and keep certified water professionals from across the state. Before he leaves the Board of Directors, we sat down and asked Councilmember Iwanski to list a few of Arizona’s immediate water challenges as he sees them.